The Thirlmere Aqueduct is a 95.9-mile (154.3 km) long pioneering section of water supply system built by the Manchester Corporation Water Works between 1890 and 1925. The aqueduct was built to carry approximately 55,000,000 imperial gallons (250,000 m3) per day of water from Thirlmere Reservoir to Manchester. The first phase was completed in 1897 and, for the pipeline sections, subsequent phases were completed in 1925. The first water to arrive in Manchester from the Lake District was marked with an official ceremony on 13 October 1894. Sarco Stopper designed and manufactured bespoke ‘Fish Belly’ & ‘Cylindrical’ stoppers, to enable the restoration work to be completed by Daniel Contractors on behalf of United Utilities. Ultra Twin Bag Stopper Set Used..
Macallan Distillery extracts water from the river Spey for cooling purposes via 3 x 12” and 2 x 10” pipes which are installed underground from the river bed into a stainless steel tank inside the pumphouse. Inside the tank within the pumphouse the pipes extend approximately 500mm into the tank and each pipe is terminated with an isolation valve which is installed with an extended spindle. Was a 2” galvanised pipe attached, which is an air supply for back flushing the intake pipes. To carry out the back flush the large butterfly isolation valve was closed and then the 2” air valve opened to send air back along the intake pipe to the river to clear any silt build up. Through time the isolation valve had worn / corroded resulting with very poor sealing, also the galvanised pipe had corroded to the extent that it was holed just where it connected to the stainless steel pipe. The end result of all this was that when the back flush was in operation, more air came back into the tank than went to the river and when the tank was drained for maintenance there was no way of isolating the water. To resolve the problem, the need was to replace the isolation valves and the galvanised pipework. Not a difficult project other than that fact there was no way of isolating the river from the tank as these five isolation valves, one per line, were the only means of isolation. The first thought was to dig the embankment between the pumphouse and the river to expose the pipes and then “freeze” the pipes to allow the work to be carried out. But apart from the quite heavy costs involved, this had other issues, if the river rose severely, which only takes a matter of hours, then the excavation could be washed out and potentially undermine the pumphouse. The other option was to install some form of inflatable bag inside the pipes, but with no access to the pipes in the river, this could only be done from inside the tank. So we purchased the double bag stoppers from yourselves and recruited a diver to enter the tank to insert the double bag set up into each of the pipes. The bags had to be inserted through the open butterfly valve and far enough up the pipe to allow the galvanised pipe to be removed and replaced with a stainless steel pipe, which would require to be welded. 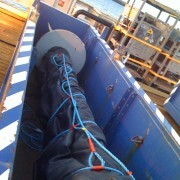 The diver inserted one double bag stopper at a time and we inflated them to 3 bar via a small manifold. Once all the bags were inserted and inflated we pumped out the tank until it was empty. All the bag stoppers fitted and inflated via the manifold and pressurised to 3 bar and the tank drained. 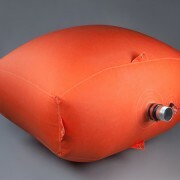 The air supply lines to each bag stopper were connected to the manifold with a quick release self-sealing fitting, which could be disconnected and the bags still remained pressurised. With the tank empty and the bag stoppers giving, I can honestly say, a 100% seal, the valves could then be removed. The air supply lines were then disconnected and fed through the open old valves, with the new valves fitted in the reverse procedure. The galvanised pipes were also removed and the stainless steel pipes welded in place. Once all the works was completed the ball stoppers were deflated and the tanked subsequently refilled. The diver then re-entered the tank and removed the ball stoppers. With all the works complete inside the tank, the valves were then fitted with actuators and the system of back flushing was completely automated. During the night in turn each pipe isolation valve closes and the air valve opens for a set time to clear the pipe, this also happens if the tank low level is triggered. All in all the project went very well, the bags were a great success, and with the double bag set up it provided a very safe working environment. The bags were inserted on the Monday and removed on the Thursday. We kept the air supply lines connected to the pressurised manifold at all times apart from the actual changeover of the isolation valves. Current regulations require that domestic drinking water is practically lead free, with levels not exceeding 10 µg/l (10ppb). Therefore, with an estimated 40% of UK homes still having their tap water fed through lead pipes, coupled with OFWATS increased regulatory requirements to improve customer service and avoid shutting down water supplies, these lead pipes now need to be replaced using under pressure solutions. It is often commented throughout the UK water industry, that after burst mains, ferrule related jobs are often the biggest cause of planned shut offs, customer supply interruptions and therefore poor SIM performance. The Arctic Driver® Ferrule Extraction System allows for the under pressure removal and/or replacement of an existing ferrule, while only isolating the specific customer having their lead service pipe upgraded to the current specification in around 20 minutes. Importantly, during this process, the rest of the network remains live. By adopting the Arctic Driver solution, water companies are improving customer service levels and reducing customer complaints. Hence, the achievement of improved SIM scoring must be seen as a long term sustainable benefit, which is derived by this new way of working. In addition, the removal of cut and capped old ferrules eliminates a significant risk of future back ground leakage and re-excavation to carry out leakage repair. By removing the need to shut off and drain down sections of main, water loss through drain down, recharge and the potential for knock on bursts, (which has been previously tabled at 63% of all network interventions over the following 7 days), the pressure equilibrium of the distribution network can be maintained, leading to a more optimal operational status. This also avoids the need for any further drilling of the main and potentially compromising its integrity. 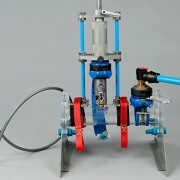 The Arctic Driver process requires the lead supply pipe connected to the Ferrule to be squeezed off and therefore stop the flow of water. The ferrule is then secured throughout the operation by the Arrestor Clamp and then frozen by delivering liquid CO2 through the Freezer Shroud which has been placed around and fixed to the ferrule. This creates a solid ice plug inside the elbow of the ferrule and allows for the supply pipe to be cut off, leaving the frozen Ferrule stub within the Arctic Driver Shroud, over which the Golf Driver Saddle is then placed. Once the saddle has been secured around the pipe, the existing ferrule can be extracted under pressure. The patented Arctic Driver Saddle, has a unique isolation feature that allows the removal of the Artic Driver equipment and ferrule stub under pressure, to leave the existing drilled and tapped ferrule hole encapsulated by the Arctic Driver Saddle. In the case of a service disconnection, the saddle can be capped off using a brass plug, or a new ferrule and service pipe can be fitted as required for a service relay or lead renewal. 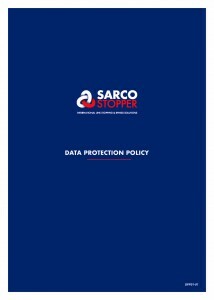 This solution was initially and continues to be developed with leading tier one contractors and Sarco Stopper to eliminate shut offs during the extensive AMP5/6 lead replacement programmes, where many hundreds of thousands of lead service pipes are to be replaced. 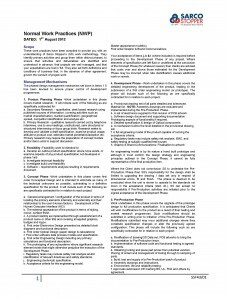 No risk of customer contacts to call centres or DG7 letters of complaint. No future leakage risk from old capped ferrules. The BSI pressure certified and patent pending Arctic Driver®: Under Pressure Ferrule Extraction System is also applicable to a range of day to day network activities such as disconnections, service pipe renewals, pressure and flow complaints and all manner of supply pipe leakage jobs.